Tiger Cub Golf new advanced players seven piece club set has been introduced for juniors who have reached a higher level in their playing skills.The set features a new high performance 410cc titanium driver, stainless steel hybrid 4/5 for all those difficult lie positions and a traditional heel toe putter that the highest percentage of low handicap players use while retaining our well proven stainless steel irons, peripheral weighted with an undercut cavity design.The set has been fitted with performance shafts,the club heads have been engineered with lighter headweights, loft and lie specifications that will allow for the optimum performance, we know the playing experience will be an enjoyable one. Titanium driver - 410cc head size,11 degree loft. Hybrid - Stainless steel,number 4/5- 26 degree loft. Tournament putter, heel toe design. Tiger Cub T1 Tour Gold stand bag. 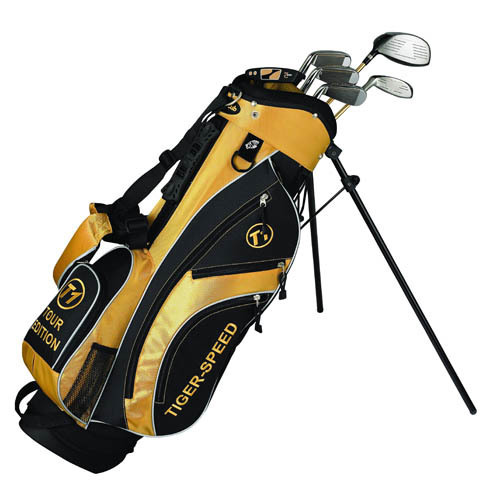 The Tiger Cub T1 Tour Gold stand bag constructed in nylon material features a 5 way top club divider, 5 zippered pockets with two external mesh pockets, dual padded shoulder strap, tee holder, towel ring, umbrella holder and rainhood. • Available in right hand only.